GCash American Express (Amex) Virtual Pay is a prepaid virtual card linked to a GCash mobile wallet. This enables users to shop conveniently online, both from local and international sites that accepts American Express. It also provides added security in the form of a card that won’t get stolen, and a security code that is renewed at the owner’s convenience. 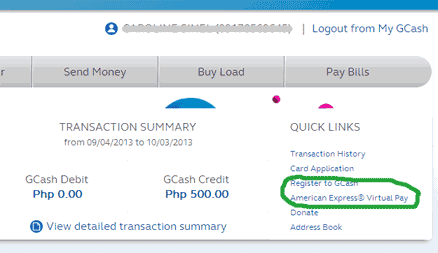 GCash Amex Virtual Pay has been available since October 2012. Login to your GCash Dashboard. Under Quick Links, click Register to GCash American Express Virtual Pay. Supply your email address, then click Register. 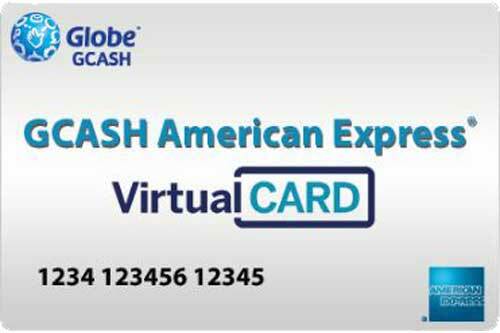 You are now registered to GCash American Express Virtual Pay. Congratulations from GCash American Express Virtual Pay – this email contains a link to the digital handbook and instructions on how to view your card’s security code. My-ShoppingBox Account Activation – this email contains your My-ShoppingBox username, temporary password and a link to activate your account. Click the link from My-ShoppingBox email. Enter your My-ShoppingBox username and temporary password, then click Next. Enter a new password, your local address and telephone number, then click Next. Your My-ShoppingBox account is now active! 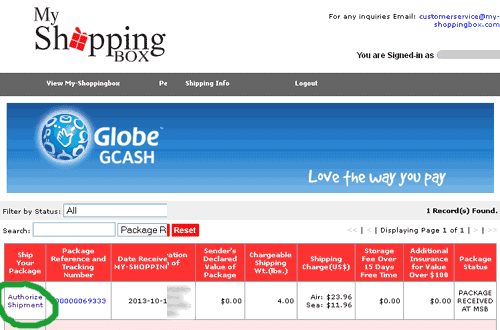 Login to your GCash Dashboard and click Virtual Pay. Your personalized U.S. address and U.S phone number is shown here. Under Quick Links, click Request Security Code. GCash will send a text message containing the security code. Before shopping, your GCash wallet must be funded. Transfer funds via online bank transfer, mobile phone banking, Bancnet ATMs, or by visiting any GCash outlet nationwide. Shop online at any local or international site that accepts American Express. Upon checkout, choose American Express as payment method. For the billing address, use the U.S address assigned by My-ShoppingBox. For the shipping address, you can use your Philippine address or the U.S. address assigned by My-ShoppingBox, whichever is convenient for you. Wait for My-ShoppingBox’s email confirming the delivery of your item to your personalized U.S. shipping address. Click the link in your email to view total shipping charges and authorize the shipment. You may choose to have your package shipped via air or sea freight. Enter your local shipping address. Choose American Express as mode of payment and enter your Virtual Pay card details. Hi ask ko lang if pwede po ba mag bayad ng Spotify thru GCash? Tanong ko lang bakit kaya Invalid card number? Tama naman nilalagay ko. But there is no quick links section. They also never sent me an e-mail. How long does it take? Can GCash be used for online international transactions as debit card? Alam nyo ba na pwede nang magbook ng Philippine Airline seats online gamit ang GCash AmEx? Recently ko lang din nalaman. Cool!